I bought my Mac Pro 5 years ago and other than the hard disk failures I just had with my add-on drives, the machine has been rock solid. I’ve kept it up on every version of OS X that’s been available and it runs Mountain Lion like a champ. Even though my Mac hasn’t slowed down with age, it feels relatively slow ever since I added my new 15” MacBook Pro with Retina display to the mix. Between the 16GB of RAM, stunning display and ridiculously fast SSD, the new MacBook Pro seemed to run circles around the larger Mac tower. Upgrading the processors didn’t seem reasonable. It already has 12GB of RAM and for the way I use the machine that provides plenty of headroom. The one area I figured could see dramatic improvement was by swapping out the 320GB boot disk with an SSD drive. This was the route I took. I did a lot of reading on SSDs, looking at Amazon reviews and finding guidance from a variety of different sources where I primarily focused on SSD reliability. Since my Mac Pro only has a 3GB/s SATA interface—not the 6GB/s that most of the SSDs support and what comes on a new MacBook Pro—I wasn’t too worried about performance. I knew it would be dramatically faster than the conventional magnetic drive I had humming away in the drive bay. I ended up settling on the Crucial M4 512GB drive. One of the fundamental changes I wanted to make was to move my iPhoto Library to the SSD. That meant making room for an 80+ GB file bundle, which is why I went with the bump in capacity. The first step in upgrading to the new drive was to ensure it would even mount in the drive rails of the Mac Pro. 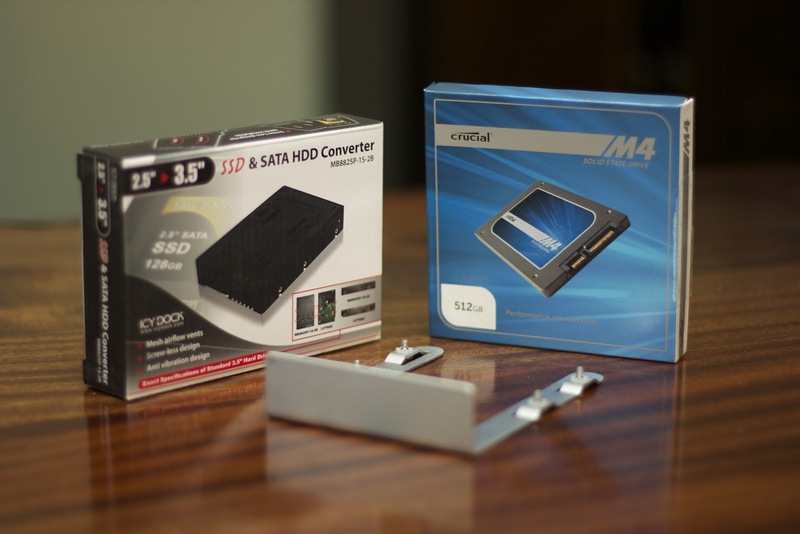 The SSDs are generally delivered as 2.5” laptop drives. Turns out what you need is a 2.5” to 3.5” SATA drive converter. For that I went with the Icy Dock enclosure. It’s a plastic box that is in roughly the same shape as a 3.5” internal drive and fits perfectly with the rails on a Mac Pro. If you do this upgrade be careful - there are lots of 2.5” to 3.5” converters out there but not all of them will line up the SATA interface with the Mac Pro’s drive system. Installing the drive into the Icy Dock takes all of a couple of minutes. Simply open the box, line up the SATA connectors with the SSD and plug it in. Snap the lid on and it’s ready to be mounted to the Mac Pro drive rails. Once mounted—there are 4 #1 phillips screws—the drive slides right in. With the drive installed I fired up my Mac Pro. The drive is not pre-formatted so I needed to get to work on that. Since this was going to be a direct replacement of an older drive, I decided to try cloning the original to this new SSD. For that I chose Carbon Copy Cloner. CCC is a nice tool for not only creating a complete duplicate of a drive, but also providing incremental updates to keep a cloned drive current. This is critical if you want to be able to recover from a drive failure in minutes, not hours. For now, all I needed to do was clone the drive. CCC saw the new drive and recommended that I use the Desk Center to create a Recovery Partition on the new SSD, which I did. Once that’s created the cloning process can kick off. For me CCC ended up pushing nearly 205GB of data onto the new drive. That process took 2 hours and 50 minutes to complete. From there I went into the System Preferences and clicked on Startup Disk. After I changed it to the new SSD drive I clicked Restart and I was now running off the SSD. Though everything appeared exactly the same on the new SSD, for some reason it didn’t carry over my Dropbox credentials. I had to log back into that tool manually. Before doing the install I recorded the time it took to perform certain tasks and load some applications. I also ran the Nova Bench application and let it calculate a score before and after the conversion. Nova Bench upgraded my score from 1042 to 1094 after the SSD was in and reported that my disk throughput went from 52MB/s to 166MB/s. For perspective my MacBook Pro tests out at 323MB/s, roughly double the performance. Given the MacBook Pro is running a 6GB/s SATA interface, that makes sense. I measured the improvement based on that first pass opening the apps. In every day usage this performance was pretty stunning. It felt as though I had upgraded to a brand new Mac. Every aspect of the Mac just seemed snappier. Back when I was heavily into Windows I found myself upgrading machines every couple of years. It wasn’t really a hardware issue as much as the degradation of a Windows machine after extended use. You pretty much HAD to format the drive, reinstall Windows and start over again. Once you get to that point it was worthwhile just upgrading the hardware at the same time. My Mac Pro has been different. It’s now 5 years old and has been through Leopard, Snow Leopard, Lion and now Mountain Lion. These were not full reinstalls but upgrades to the existing OS. It really is amazing to me that with this SSD upgrade I’ll likely get at least another 2-3 years out of the machine, if not more. Sure, Macs may cost a little more up front, but the ROI is easily justified if you'll be keeping it long term. Got some advice for SSD upgrades? Please drop a note in the comments. My first experience was to take an older Macbook (Model 7,1 - 2.4GHz Intel Core 2 Duo, 1066MHz bus) and to put in an SSD. This Mac only supports 3GB/s SATA so I picked up an Intel X25-M 160GB SSD (under $100). The performance difference was ridiculous. It is such a pleasure to use. I then decided to find an older iMac to upgrade. I bought an iMac (9,1 - 2.93GHz Intel Core 2 Duo - 1066MHz bus) and put in a Samsung 840 series 250GB SSD. It's awesome. SSD adds some serious life to older machines. I can't imagine ever owning another computer that isn't SSD based. * only hiccup in the iMac upgrade was the Samsung SSD came with a 2.5" to 3.5" adapter but the screws that the iMac used to hold the drive in place didn't fit. I was able to drill out the holes and got it to work. @Eytan: The Mercury Accelsior looks incredible. Expensive but I like that blade model where you can just upgrade the SSD and get credit for the previous one. I have the older model Accelsior without the eSATA. Got the 960 GB model. I copied my usual boot drive except the downloads to it. Made a hard link to redirect the downloads to a regular HDD. It's made a big difference to my 2009 Mac Pro and I was used to a hardware RAID 6 boot drive. It's the access time that made the difference, not so much the throughput which was already high. pleasant surprise was Safari pages just loaded and "felt" a lot faster. Once I get my NVIDIA 680 gtx video card added this machine will feel totally new. Did you do anything with TRIM? I am reading up on the SSD replacement process and have read enabling it is better for the drive. Interested in what you think. you can get a little bit around the 3 GB/s limit by installing two SSDs half the size in Raid0. @Scott: Yeah, I'm starting to regret not going with that option the more I read about it. Seems like pretty impressive performance. @Derek: I hadn't heard anything on TRIM until you brought it up! Thanks for that. I'm working on a blog post now to cover TRIM related issues. Should be up in a couple days. @Anon: Not sure I'd go with a RAID 0 set up with two SSDs now that I know about the Accelsior. 2 SSDs in Raid0 is the cheapest way. As I told you, we have done this a "long" time ago. With 80% full, in work modus (about 30 apps running), I get about 350 MB/s write and 500 MB/s read (measured with Blackmagic disc test. or the king way with Accelsior. I am looking for your help finding the proper SSD for my particular Mac Pro. Could you tell me which SSD is best and which conversion kit I need? I also need a little hand-holding in converting the boot drive to the new SSD, once I install it. @Emily: This post is a little dated now. Since Yosemite came out any support for TRIM has been effectively eliminated, making SSD selection far more limited. 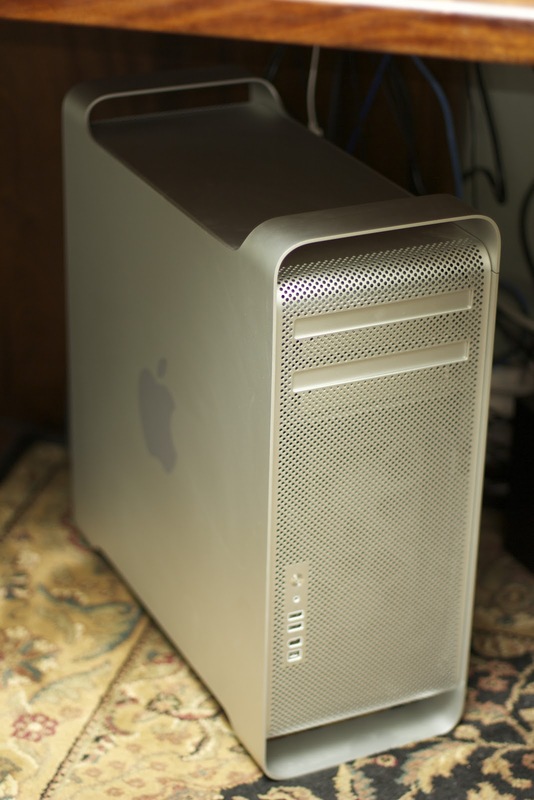 I recently upgraded my Mac Pro tower (referenced in the above blog post) with an OWC upgrade. The OWC folks are excellent at identifying exactly what you will need and their SSDs do not require TRIM support to operate long term. David. Thankfully I ordered my new SSD from OWC!!! Installation is ridiculously simple. Plug the SSD into the adaptor, attach this onto one of the pull-out drive frames on your Mac and you are ready to go. Michael here. Reading your Blog over and over to make sure I fully understand what I'm about to get into. Please give your advice or opinion. I want to upgrade my Mac Pro 12 core 64 GB to SSD for applications. For Christmas I was given an Intel 530 series with 240 GB by a very attentive daughter to upgrade my Mac. Will this work fine with my system storing just applications there and media elsewhere? @Michael: Yes, that will improve performance. The downside is if you're running Yosemite it no longer supports TRIM (the technique SSDs use to clean up deleted space). That said, if you are primarily putting your applications and the OS in there it will be quite a while before that becomes an issue. I believe most SSDs have an option for manually cleaning up that deleted space, though it's very time intensive. This is one of the reasons I ended up switching out my Crucial SSD for an OWC SSD - the OWC Mercury drives are designed for Macs and do not need TRIM support.